Man, this one took me forever to complete. Although it came out a few months ago, I finally finished it a few days ago. The game is split into the “First Chapter” and “Second Chapter.” The two chapters make up a single story so the wait between them was pretty agonizing. The first chapter was released in 2011 in the US and we had to wait 4 long years to conclude the story. I was tempted to write a review for the chapter separately to assuage the wait, but I’m happy that I waited to do it as a complete set. So, here are my impressions on The Legend of Heroes: Trails in the Sky. Please forgive me if I gush. The plot of this game is a little hard to summarize. It’s essentially an adventure story where a girl sets out to become a bracer, which is kind of like a police officer, and gets caught up in a much larger plot. It starts off a bit slow, but once the central plot starts going, it really gets kicking. There are some slow patches, but when they hit, you’re so caught up in the world that you don’t really notice them. There are even side characters that have stories that run alongside the main one. They’ve built an extremely livable world that makes me excited to see future games set in that world. The translators of the game, XSEED, did an amazing job with the localization of this game. They kept the game funny and really made sure that there was something fun luring around every corner or sign. Combat in this game is turn based. However, the turns are more fluid than a strict turn based game. There are some abilities that can change the turn order rapidly. This is helped by the fact that some turns grant bonuses that may incentive a player to use one of those special actions. 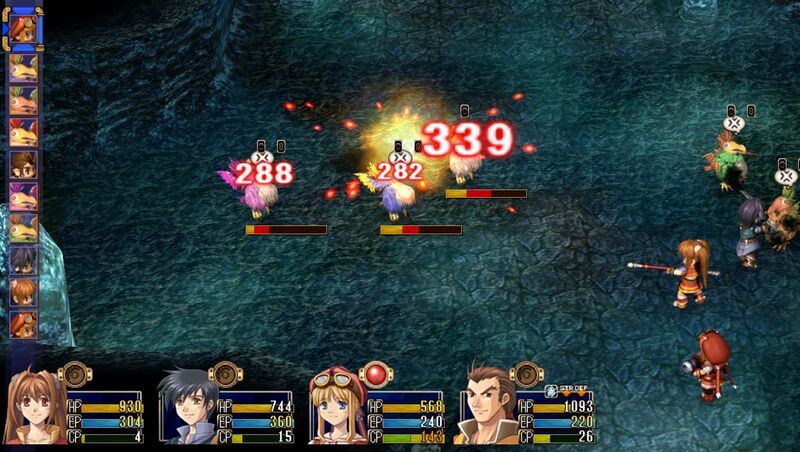 Enemies range from really difficult to fairly easy despite your difficulty level. Everyone will find a bit of a challenge when they play. However, if you really do enjoy a challenge the hardest setting in this game is HARD. This is a good game for someone looking for Final Fantasy type gameplay. The customization of abilities is really unique and can allow for great number of different combinations and loadouts. Some of our main cast. You will love these characters. Estelle, the protagonist, is atypical for any genre. She’s spunky, tough, and gets things done. She makes you like her and you really start rooting for her. I have rarely seen a female character done so well in a game, so this made me very happy. Joshua, the deuteragonist, is a little less interesting. He is basically your typical cool guy with a secret. However, his chemistry with Estelle and the other characters is so good that it makes him more interesting than his typical premise. Since this is a JRPG, the cast is huge. I would spend forever talking about all the other characters individually, so I’ll treat them as a group. The companions are all unique and extremely interesting. They have so many aspects that they are fully fleshed out characters themselves. I really wish I could just rant about how I love them, but just know that I do. The main villains and their organizations are great. They’re shadowy and powerful and always feel like a threat. They are all interesting characters with their own personalities that makes you grow pretty attached to them. Finally, there are some very interesting side characters here. You can really see them as people within the world. They are living their own lives and you see them throughout the games. I really cared for these characters and was hapy to have a game with all of them. Some of the penguin enemies in the game. It may look old, but it’s really creative. I’ll be frank, the graphics in this game aren’t amazing. This is an older game (from 2004 in Japan) and the graphics don’t hold up very well. However, this game is stylistically gorgeous. The art style is one that is very atypical of JRPGs and it works really well. The characters are proportional and don’t have that typical anime look. The monster designs are also great. Few games make a point of having great enemies such as Creepy Sheep and Evil Penguins. I think there is so much good in the game that players should overlook the outdated graphics and appreciate the great style. The music in this game is phenomenal. First, there are so many unique pieces, that you may not even notice some of them. However, they are amazing in their variety and each piece fits their situation. 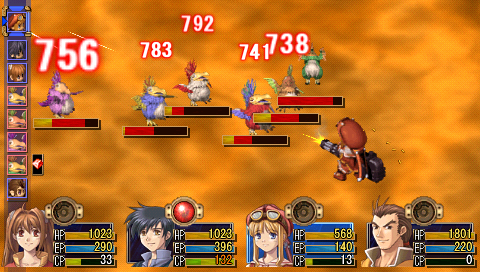 The score for the “fun” battles are light and jazzy and really make encounters enjoyable. I really can’t emphasize how great this jazzy music is, it’s so different from everything I’ve come across and it fits in a way I thought was impossible. The epic encounters create a tense atmosphere that really lend gravity to a situation. Just know that I bought the soundtrack as soon as I finished playing. This is one of the best JRPGs in the industry. I put it on par with the best Final Fantasy games. If I was forced to give the game a score, I’d give it a 10/10. I believe this game is one of the best of the classic JRPG genre. Everything fits together to make an extremely enjoyable game. There are some flaws, but they are easy to overlook. If you’re a fan of the genre or series, definitely check it out. If you’re new, this may be a bit daunting as your first try, but definitely give it a go once you get acquainted. I can’t wait to play the next game to get localized. I’m looking at you Trails of Cold Steel!